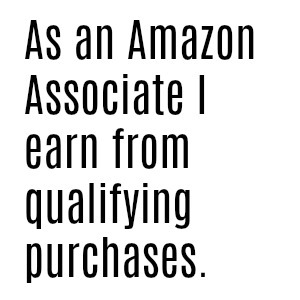 *This post contains affiliate links and I might receive a small commission. Affiliate links are indicated with an asterisk. If you’re taking small steps to reduce your waste and make your home more eco-friendly, or you just want to take the trash out less often, this post is for you. 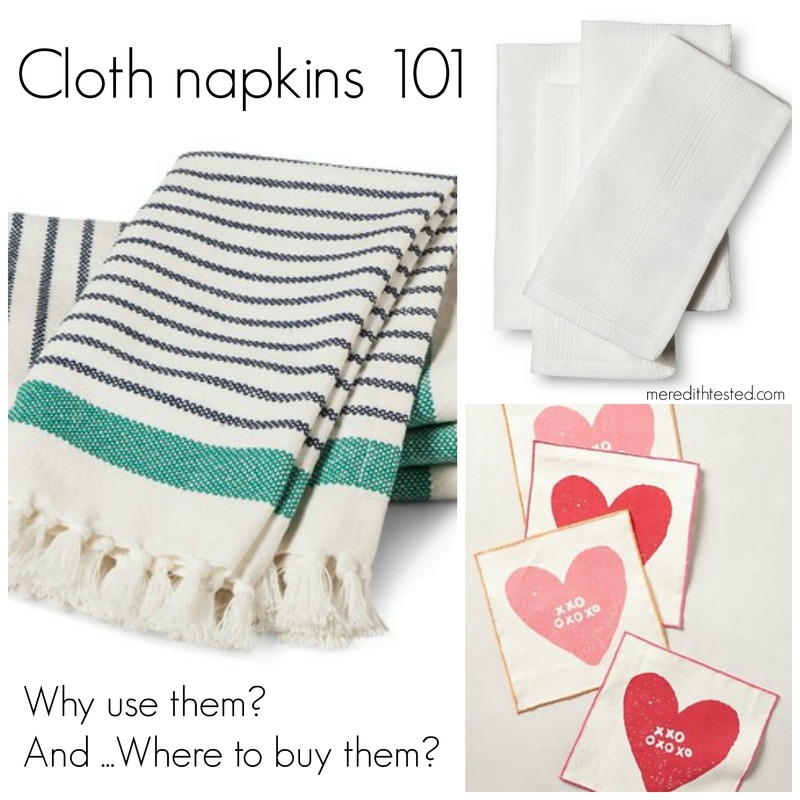 An easy, inexpensive and painless step is to start using cloth napkins! Your guests will think you’re being fancy and stylish, but you will know you’re being frugal and a friend to the environment. And, let’s face it, cloth napkins are way more effective at cleaning up spills than their flimsy paper counterparts. Cloth napkins can be found in so many colors, styles and price points, you can certainly find something that fits with your lifestyle. Get them monogrammed if you want, choose napkins that are simple and timeless, or get them in a fun pattern*. Another wonderful effect: Give a guest a paper napkin and they might go through several during one visit. But rarely do people need more than one cloth napkin. It’s magic. I keep a cloth napkin with me in my purse, too. I use it instead of paper napkins at restaurants, as a placement during picnics and as an impromptu container for leftover sandwich halfs or bagels my daughter inevitably doesn’t finish. Cloth napkins are easy to maintain, too. Just throw them in your hamper and run them with your clothes in your next wash. Choose napkins in a natural fiber like 100% cotton or linen. They will be durable, easy to wash and can be composted at the end of their (very long) life. The bonus with 100% cotton and linen is that they’ll get softer and more absorbent the more you wash them, too. Start with a collection of everyday napkins. A good rule of thumb is the number of individuals in your household times two. Next collect napkins for fancier occasions. No need to buy paper napkins to celebrate every seasonal holiday or birthday. Start with 10-12 or more depending on how many guests typically attend gatherings at your house. Now let’s turn our attention to an often-forgotten area: the bar. Cocktail napkins are adorable and very useful. But there’s still no need to buy a new package for every party or get-together. Save your money and still offer up cute cloth cocktail napkins* to your family and friends. How fun are these snowflake napkins on eBay*?! TIP: Keep it simple and you can use the same napkins for every occasion. Or pick simple patterns and solid colors that can be mixed and matched so you can grow your set slowly. Many times I find napkins in sets of 4 or 6. No need to follow my recommended quantities exactly. Just figure out what works for your family! You can find cloth napkins* positively everywhere these days in durable, beautiful fabrics (again, go for 100% cotton or linen) that will last for many years and through many, many washes. Next time you’re in a kitchen or home store, take a look at their selection. Check local secondhand shops, too. I’m so pleased with how often I’ve found napkin sets in near-perfect condition for just a few dollars. You can also find similar styles on eBay. For example, I found those cute heart napkins on eBay* – perfect for Valentine’s Day, an anniversary or a birthday. Now that you’ve stopped using paper towels and paper napkins inside your home, take it to the streets! Carry a cloth napkin with you and use it wherever you need to. Perhaps it’s at a restaurant that uses paper. Or perhaps you need a little impromptu container for your leftover pastry or sandwich half. Related to this practice, I always leave positive comments for establishments that use cloth. Tell the staff, send an email or tweet – just let them know that customers notice and appreciate their efforts to eliminate the use of single use disposable items. This post is very informative and easy for anyone to try out! I’m currently looking for cloth napkins to add to my kitchen and have found some cute ones at World Market.